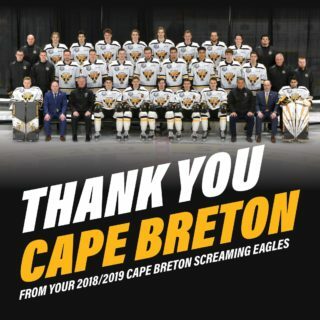 The Cape Breton Screaming Eagles began a five game home stand by extending a winning streak to five games, topping the Sherbrooke Phoenix 5-1 at Centre 200. Mitchell Balmas would start the scoring for the home side, lighting the lamp twice in the opening period with his second of the night being his 30th of the season. His first goal came after a turnover in the right face-off circle and Balmas took the puck and blasted it through Thommy Monette. Balmas’s second of the period would come as he covered the blueline for Antoine Crête-Belzile. 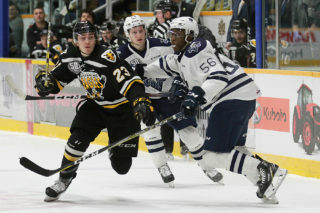 Crête-Belzile dropped the puck back to the point and Balmas fired it through traffic to double the margin, and the Eagles were up 2-0 at the first siren. The Eagles would outscore the Phoenix by the same score in the second period. Egor Sokolov lifted a shot over Monette at the 5:31 mark to make it 3-0, and later in the period Brooklyn Kalmikov would jab a rebound in on the short side to push the edge to 4-0. Period three would be dominated by special teams. 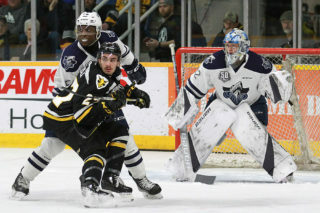 After not earning any power plays in the first 40 minutes, Sherbrooke would go to the man advantage six times in the third stanza, and a power play marker on the second half of a high sticking double minor would end Kevin Mandolese’s shutout bid. Patrick Guay converted a feed from Samuel Poulin to put a shot over Mandolese and get the visitors on the board. Not to be outdone the Eagles would counter with their own power play marker before game’s end. 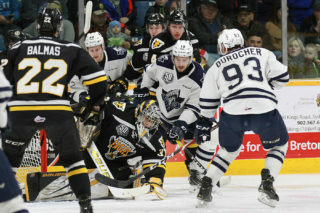 Mitchell Balmas zapped a one timer through the legs of Monette to complete the hat trick, and in a humorous celebration, his teammate Shawn Boudrias would put one one of the has thrown by a fan over the helmet of Balmas. Balmas’s hat trick goal would conclude the scoring for the evening. Mandolese turned aside 24 of 25 shots in the victory, while Monette allowed five goals on 24 shots in the loss.